Associate Professor Mahdi Kioumarsi from Iran came to Norway to complete a doctorate. He thinks it was easy to get used to life in Norway and likes it so much that he intends to stay a few more years. 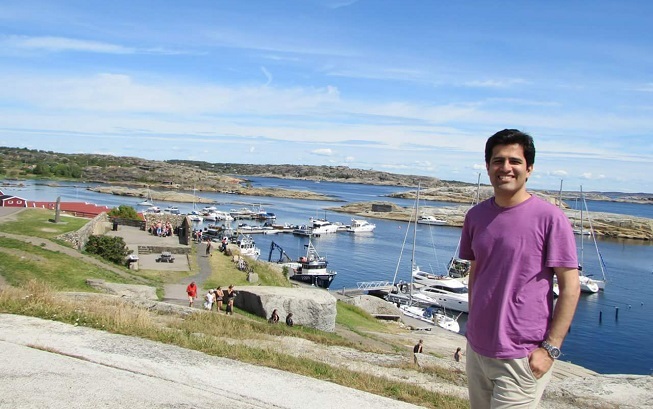 Mahdi Kioumarsi traveling around Norway. Shown above at the “The World’s End” in Tjøme, 130 km south of Oslo. Photo: Private. The second reason was my relatives who have been living in Norway for several years. And let’s not forget, the salary and the lifestyle in Norway are better in comparison with many other countries, he says. Dr Kioumarsi has been in Norway for six years now, the first four in Trondheim in connection with his doctorate at the Norwegian University of Science and Technology (NTNU). He has spent the last two years in Oslo, where he is employed as Associate Professor at Oslo and Akershus University College of Applied Sciences (HiOA). The transition from Iran to Norway went more smoothly than one might expect. It is easy and everything is clear when you start here. In every institute, they introduced me to an older colleague who helped me to become familiar with necessary details and other colleagues. In the beginning, I was invited to have a personal meeting with the person in charge to give me useful information in different areas to help me to get started. Also, the institute leader is available to answer your questions – even regarding problems outside the university. So there was no problem getting established and starting my work at either NTNU or HiOA, he explains. Foreign researchers usually rent a room or flat the first couple of months until they find their own place. But arriving right at the start of the academic year can make this a bit difficult, as Dr Kioumarsi experienced. He attended a number of viewings without any luck. He admits that was somewhat stressful when he was also supposed to be getting his research underway. Fortunately it only took two to three weeks before he was successful. Both my wife and I are happy here. Norwegians are nice people, both in Oslo and in Trondheim, Dr Kioumarsi says. Even though he knew no Norwegian when he arrived in Trondheim in 2011, Dr Kioumarsi managed to get by well with English at the university and in the city. You do not need Norwegian when going out and buying something, but for better communication you need the language and it is really better to speak Norwegian, he adds. Mahdi Kioumarsi worked very hard as a doctoral fellow, often late into the night. But he has since adapted to the Norwegian work pace, concentrating on research and teaching while on the job and on his private life when at home. During the workday from 8:00 to 16:00 or 17:00 Dr Kioumarsi does all the necessary preparation for lectures, workshops via Skype, article writing and research. It is completely possible in Norway to manage the financial aspects of personal life. Everything is well-organised, based on rules and customs. There are many organisations to help you deal with different kinds of problems, he explains. His primary interests are playing football with friends and going out for walks in nature. Dr Kioumarsi is surprised by the open tone of communication between employers and employees in Norway. If you have a busy schedule, saying “No” is fully acceptable here in Norway. For example, if you are asked to do something you can decline and say your time is taken for the next week, and that you can do it later. In some countries, it would be awkward to say no to your boss. The academic system in my country is based on the North American style. For instance, when your supervisor tells you to do something you feel it is your duty and you have to do it. However, in Norway there is more possibility for discussion and negotiation, he says. NTNU is at a high level in the world in my field when you compare publications and laboratory facilities. In addition, the faculty members are very competent. HiOA is a university college and is going to have university status soon. In this aim, they have started to hire more researchers and are focused on quality and publications, Dr Kioumarsi concludes. You don’t need to worry about being a newcomer; many people want to help. Just get started on your work and focus on your research and everything will eventually work out. Everything is well organised here. The universities help out with accommodations. Look forward to academic life here, but don’t forget to explore Norway’s beautiful nature.